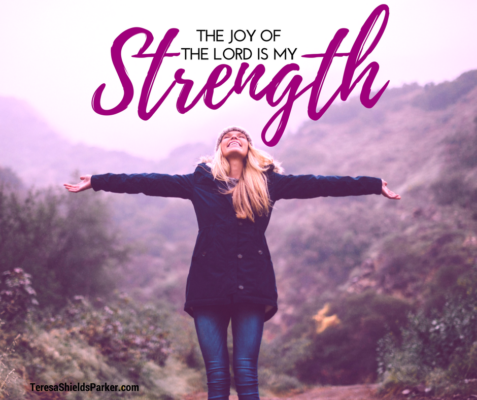 Is the Joy Of The Lord My Strength? The joy of the Lord my strength. But how? These are great sounding words, but I never thought that the joy of the Lord could literally become strength to my body. Recently, though, I had a head-on collision with this verse’s reality and it changed me. I stopped in mid-stride thinking of all the issues I’d been experiencing, not the least of which was stage three adrenal fatigue. I also have other diagnoses many stemming from the fact that 13 years ago I weighed 430 pounds. Even though I’ve lost more than 250 pounds I still have residual issues such as joint pain and nerve damage. “Yes, I do need prayer,” I replied. I could have gone with my first thought which was, “I don’t have time now.” A little voice sitting on my shoulder whispered that in my ear. It just proves that the evil one always knows when victory is headed our direction and will try to stop it. In the course of the next few minutes Lynda and Chantel introduced themselves and prayed for me. I’ve been prayed for many times by some of the best healing ministers, but when Chantel prayed, something happened. There was a tangible shift. Over and over her prayer was, “Lord, infuse her with joy. Joy, Lord. She needs Your joy.” At first when she prayed for joy, my logical and rational left brain came against it. It was telling me I didn’t need joy because I wasn’t sad or depressed. This was a true statement. I was just … tired. The left brain stopped chattering when I began to literally feel power surging through my exhausted body and brain. Logic can’t come against what we feel. Feeling is a right brain process that basically says, “Wait left brain, this is different. Something real is happening here. Let’s pay attention.” It started in my gut and moved up like a lightning bolt into my brain. Every part of me along the way felt it. Adrenal fatigue for me was way more mentally exhausting than physically tiring. But still I had to sleep more, guard overloading my schedule and not overdo anything. I had to pull back. That day, this infusion of strength was tangible. Scripture says, “Christ’s explosive power infuses me to conquer every difficulty.”1 I’ve quoted this Scripture many times, but right then I experienced it first-hand. Strength came into my body through a prayer for joy! I was intrigued and wanted to study it even more. How does the joy of the Lord become my strength and how can I make sure I always have it? I learned that joy is not happiness. Joy is a deep-seated emotion anchored in the assurance that no matter what situation I am in, God is right there with me. Happiness depends on my current situation, whatever is happening in the moment. That emotion will likely be gone when I face any sort of angst or difficulty. Joy, though, is lasting. It is the deep feeling of knowing that even in the midst of life-defeating situations, God is in control. He is the Source of true strength. It’s a supernatural strength. It cannot be explained in human terms. It makes no sense. Whatever words the people had heard read felt burdensome until they understood the meaning was that God was watching out for them. He alone was their strength. He had brought them through great difficulty. They remembered their legacy. They remembered how God had led them and was still leading them. That brought them deep joy. Remembering how God had led them in the past empowered them to understand He would do the same in the day they were in and in the future. They had nothing to be sad about. When I remember what God has done for me, when I share my testimony of His goodness and faithfulness in my life, it brings me joy and that joy strengthens my faith in God who has never failed me and will never leave me to face life alone. Paul tells us, “The Kingdom of God is not meat and drink but righteousness, peace and joy in the Holy Ghost.”6 Joy is an integral part of the Kingdom of God coming here on earth because to have the joy of the Lord means to trust His strength to see us through. Strength comes when we admit our weakness and rely completely on who God is and how He has operated in our lives and longs to continue to lovingly lead us. There is nothing like the joy which comes in that realization. We hope to open the lower cost six-month coaching class, #KickWeight 3 around May 10 or sooner. There will be limited spots so be sure to get your name on the waitlist to know exactly when the doors open! I may not be doing this class again, so don’t miss this one! To learn more about the group and put your name on the waitlist, go HERE. See you in the group!